CIENFUEGOS, Cuba, Mar 20 2013 (IPS) - Goat farming is becoming popular among farmers given land to use as part of the economic reforms implemented in Cuba since 2008. 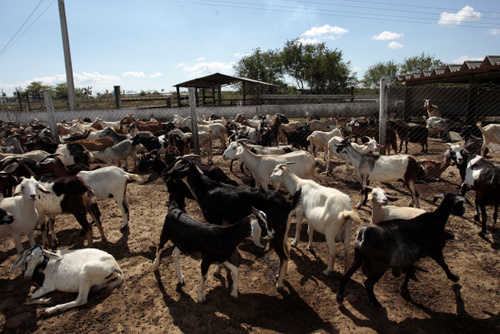 The increase in goat rearing, in provinces like Cienfuegos on the southern coast, could help expand the limited range of basic food products available to Cubans. “The goat is an animal that requires abundant food and care, but its meat and milk are highly nutritious,” Dayamí León, a veterinarian who looks after 512 goats on the 26-hectare Carolina farm near the city of Cienfuegos, 230 km southeast of Havana, told IPS. León left her job in a state company to work on the farm, which was created in 2008 when her husband applied for some of the unproductive land being redistributed as part of the government’s strategy to increase domestic food production. The farm now gives work to 12 people, including 10 family members, and it produces some 51,000 litres of goat milk annually. León and her husband also have cows, bulls and pigs, and they grow a few crops as well. León is responsible for the health of the animals, the births, and the slaughtering. Small livestock rearing is the third most popular activity for which people in Cienfuegos are applying for land under the redistribution programme. In this province, some 78,000 hectares were distributed as of February to 8,200 people since the approval of decree-laws 259 and 282 in 2008, which stipulated that idle state land was to be distributed under usufruct to people who would farm it. In June 2012, 975,000 hectares, out of a total agricultural area of 6.6 million hectares, were still available for redistribution, down from 1.8 million hectares when the strategy went into effect. Decree-law 300 replaced the two previous laws in December, expanding the amount of land granted to each beneficiary from 40 to 67 hectares. It also included fruit production and forestry on the list of permitted activities and allows beneficiaries to build housing and other production-related infrastructure on the land. In addition, the usufruct rights can be renewed after 10 years. In 2010, the government announced massive lay-offs of public employees, which were to potentially affect one million people by the end of 2011. But the government has slowed down the pace of the reforms, to make them less traumatic. Prior to the slashing of the public payroll, the government employed more than 80 percent of the workforce in Cuba. Thousands of the people who have lost their jobs in the public workforce have applied for land under the redistribution programme. Jorge Antonio Rodríguez, provincial director of land control in Cienfuegos, told foreign correspondents. The sector has grown 60 percent in the province since the redistribution began. There is still land available for redistribution in Cienfuegos. León said the success of small livestock farms depends on good design and planning. After receiving advice from an agronomist, her family farm began to grow white mulberry (Morus alba) bushes for animal feed. The berries are also a tasty addition to the family diet. “The bushes make the animals grow faster, due to their high protein level,” she said. The Carolina farm, considered the best producer of goat milk in the country, has milking machines and produces hay with a recently acquired hay-making machine. The farm also uses animal manure as compost on the plants grown for animal forage, including white mulberry, king grass (Pennisetum purpureum) and the moringa tree (Moringa oleifera). The aim now is to maximise production. Of the 380 adult goats on the farm, only 30 are milked twice a day. “We have to make more stands to be able to milk the rest of the goats. The ones that are only being milked once a day are being underused,” said Regino Rodríguez, León’s husband. Rodríguez, who used to work as a technician at the Camilo Cienfuegos oil refinery, is grateful for the new family business, which brings them a higher income. He also said it feels good to provide goat’s milk for local children who are intolerant of cow´s milk. “Our city is small. We generally provide milk for around seven kids,” he said. In Cuba, children up to the age of seven are guaranteed a daily ration of milk at subsidised prices. Youngsters who can’t drink cow’s milk are given a substitute, like goat’s milk. Carolina and other farms must sell most of their output to state-owned companies at pre-established prices. But thanks to the reforms, they can sell the surplus production to businesses catering to tourists, or can take it directly to farmers markets, where prices are set by supply and demand. But the changes in agriculture, which were given priority in the economic reforms adopted by the government of Raúl Castro, have so far fallen short of the hoped-for results. Cuba continues to import 1.8 billion dollars annually in food. Nor have there been significant improvements in the cost of food. Local officials in Cienfuegos acknowledged that food prices have not been brought down far enough. The government especially wants to reduce imports of milk, due to the high international prices. Goat milk production rose between 2006 and 2011, particularly thanks to non-state production, according to the national statistics office. But it went down by 0.2 million litres, or 8.3 percent, in the period January-September 2012, with respect to the same period in 2011. The fall was partly offset by an increase in cow milk production in the same period. Pablo, a two-year-old boy with a cow’s milk protein allergy, has been drinking goat’s milk since he was seven months old. His mother, Lilian García, told IPS that the amount of milk she receives for her son from the ration card is sufficient. She also said many people in Cuba don’t consume products from goats because they are not familiar with them. These goats look overcrowded. They need to be out in a pasture!